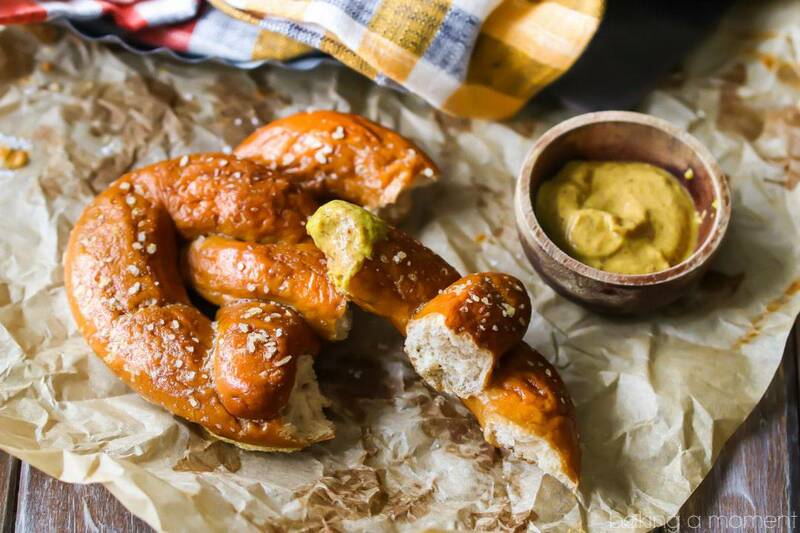 Best ever homemade soft pretzel recipe! These are so chewy and good- perfect with a sprinkling of salt and a dunk in grainy mustard. It’s October, and when I think of October I think of one thing. Well, that’s not exactly true. I think of a few things: apple cider donuts, Halloween, and all sorts of pumpkin spice recipes. But there’s one other thing! I try to bake up at least one batch every fall. Preferably on a chilly, gray day while all my boys are watching football on tv. These are made with beer so they have a really full, yeasty flavor. And they are pillowy-soft yet stretchy and chewy at the same time. So good with a sprinkling of crunchy salt and a dip in grainy mustard! Or beer cheese! I would recommend using a strong IPA for this recipe. It will give the most flavor. But it would also work really well with a dark stout like Guinness. The alcohol will evaporate during the cooking process, but if you prefer not to use beer you can just substitute with tepid water. If you’re intimidated by the shaping process, don’t be! Just have fun with it. Here’s a step-by-step picture tutorial so you can see how to form the twisty soft pretzel shape. If the dough is too smooth and slippery to form the ropes, try moistening your hands a bit with water. And don’t forget the egg wash! 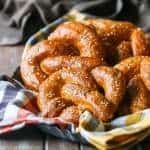 Everything you read says the baking soda bath is what gives the soft pretzels that gorgeous burnished brown color, but trust me. If you don’t brush on the egg wash you will not get the color. I think you’ll really enjoy these homemade soft pretzels! It’s such a fun kitchen project and the result is so hearty and delicious! Stir the warm water, brown sugar, and dry yeast together in a small bowl. Place the bread flour & salt in a large mixing bowl and whisk together. When the yeast mixture looks foamy, stir it into the flour mixture. Stir in the beer until a stiff dough forms. Knead the dough for 10 minutes, or until it feels silky and elastic. Place the dough in an oiled bowl, cover with plastic wrap, and allow to rise in a warm place for 90 minutes, or until doubled in bulk. Punch down the dough, and divide it into 8 equal portions. Roll each portion of dough into a rope about 20-inches long. 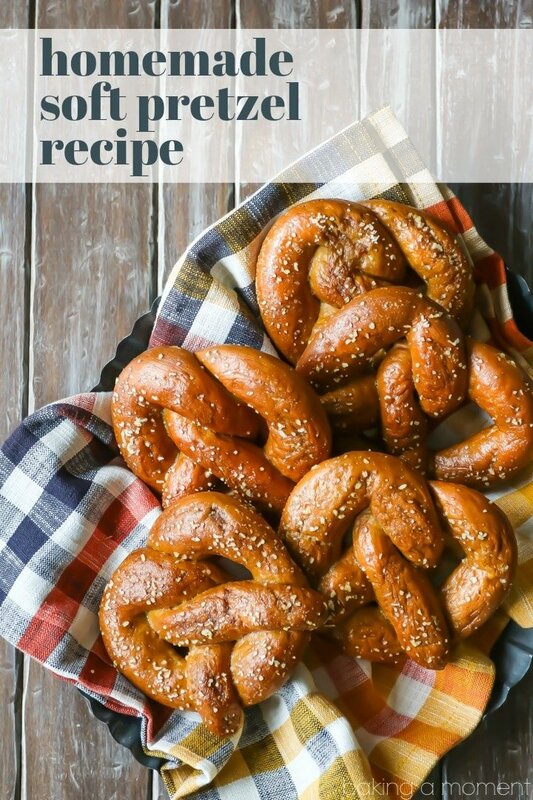 Twist into a pretzel shape and place on an oiled baking sheet. Cover loosely with plastic wrap, and allow to rise for 30 minutes. Bring a large pot of water to a simmer, and add the baking soda (liquid will foam up and then settle back down). Boil the pretzels (one or two at a time) in the liquid for 1 minute on each side. Drain on clean towels, then transfer to parchment-lined baking sheets. Bake for 18 to 22 minutes, or until dark brown and shiny. 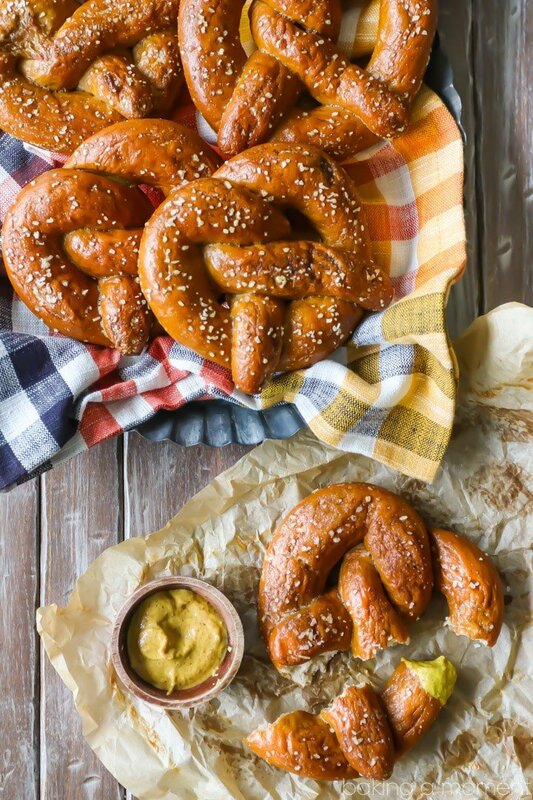 *bread flour has a higher gluten content, and will yield chewier soft pretzels. Yum! Love soft pretzels. Gotta try this recipe. These are perfect! And so yummy fresh out of the oven when they’re still warm!!! These are one of those things that are SO MUCH better when homemade! Thanks for the fabulous recipe! Soft pretzels are a staple here all year long. Just perfect! Since i’ve been to Florida a few years back, i loooooove pretzels. I’m so glad you’ve a recipe for them and i definitely give it a try. There’s only one thing i don’t understand what it is. And that’s IPA. What does it mean? Will you please explain to me? Thanks in advance. I know it’s January now but i like pretzels all year round! When i think about it i can almost taste them. And it’s about time i learn to make them myself so that i can eat them when i want! Can i freeze them when they’re baked? I hope so, since we’re only together and i don’t think it’s a good idea to eat them all in one go! Till next time and looking forward to your answers. 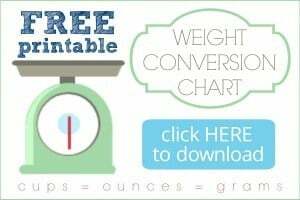 So happy you like this recipe! IPA is a kind of beer. Hope you enjoy!